Juneau is more than stunning views, imposing mountains, and running blue waters. This is a city full of history that spans for centuries before colonization and the Gold Rush which gave it its name and legacy. 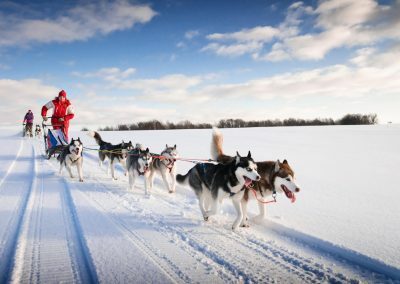 It’s a city with character and personality, and arguably deserves to be called the heart of Alaskan culture. This is felt in the city year round, and seen in the architecture and museums around the Alaskan capital. As you might be looking for lodging in Juneau, we want to present a brief history of the city of Juneau. 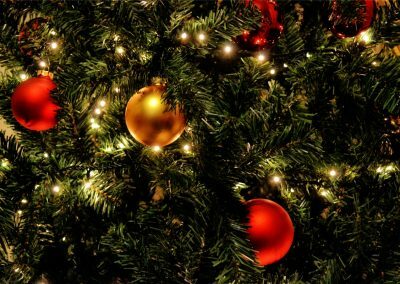 Of course we are limited in scope, but we’ve provided links throughout the text so you can explore more on this topic on your own. The first people to inhabit the area north and south of Juneau were the Auke people, a subgroup of the Tlingit group of Alaska Natives. The Aukes, aka A’akw Kwáan (which means Small Lake People) lived along the Northwestern coast of North America for thousands of years. 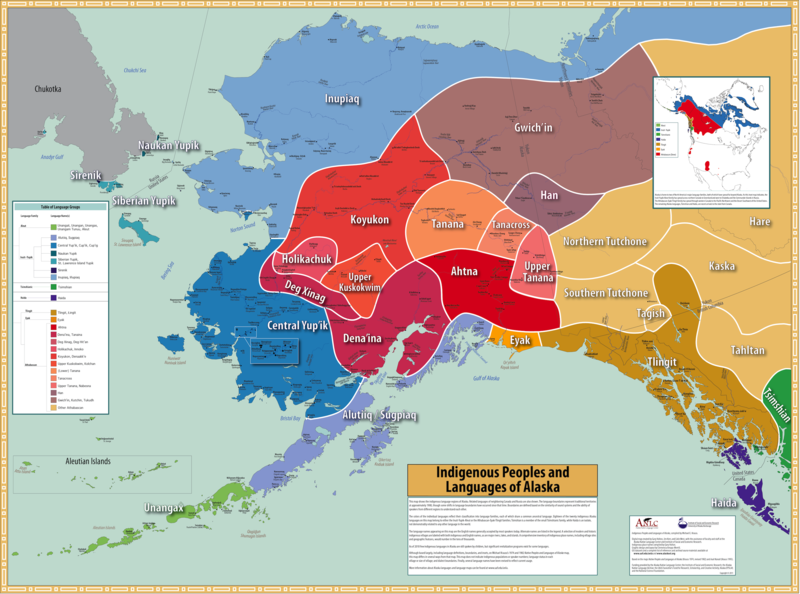 Here is a map showing the indigenous people that populate Alaska and Western Canada. The Tlingit Natives speak the language by the same name – Tlingit. It’s an Alaskan language with many sounds that don’t exist in English (here is a list of Tlingit words. Have a try and see how many of them you can pronounce). 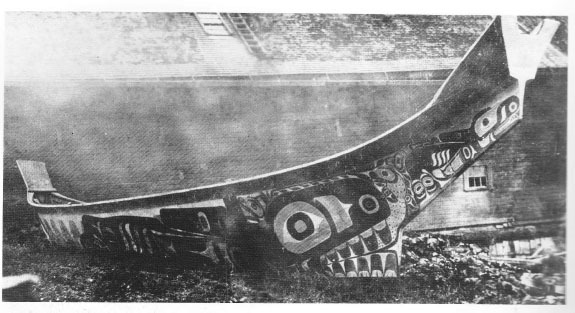 According to legend, the canoe may have even come with the first people when they migrated to what is now Southeast Alaska and since then, defined the way the people here interacted with the landscape. Learn more about canoe culture. The Tlingit have always been skillful fishermen, with elaborate fishing gear and knowledge transmitted from generation to generation. The rich Gastineau Channel aquatic life provided them with endless supplies of salmon, halibut, and other fish. Their diet also included wapato, berries, and seeds that are found in the area. The Tlingit built shelters along the coast in such a way that the entrances were always facing the sea. Each house had a Totem Pole placed in front of it. Tlingit society has always been multi-layered, involving various social classes, kin ties, and territorial units. The Tlingit people were divided into eighteen great families, each of them being represented by an animal, such as a wolf, bear, eagle, beaver, whale and other animals. The totem poles signified the origins of the family living inside the house. Interestingly, members of the tribe were only allowed to marry a person with a different family totem. (Source). 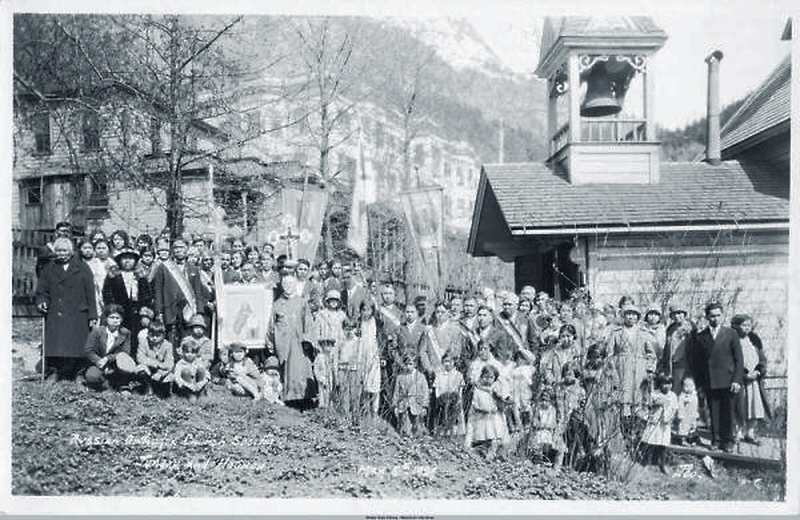 The Juneau area became a major trading center between the Tlingit people and neighbouring tribes such as Tsimshian and Haida. And the local culture kept blooming until the first encounters with European colonists. To find out more about the local native history, art, and culture, visit the Walter Soboleff Building and the Alaska State Museum in Juneau. In the 17th century, the Russian Empire embarked on a mission to explore any possible connections between Siberia and America. Semyon Dezhnev was said to have “discovered” Alaska when one of his ships was carried away from the Bering Strait. The Second Kamchatka Expedition under Alexei Chirikov set ashore the Prince of Wales Island on the 15th of July 1741. Round, wooden Russian Orthodox Church in Juneau, 1924. The church is still there and in excellent condition. Starting with 1743, Russian America has been established, with the capital in Novo-Archangelsk, which today is Sitka. Although Russian colonies populated the area for over 100 years, they never really settled. In 1867 the Russian Empire sold Alaska to the United States for $7.2 million (over $129 million in today’s dollars). At the time, the Russians had no knowledge of the gold mines that were yet to be discovered in Alaska (not to mention the oil). There’s little knowledge about how the Russians lived in Juneau. You can explore further at the Juneau-Douglas City Museum. 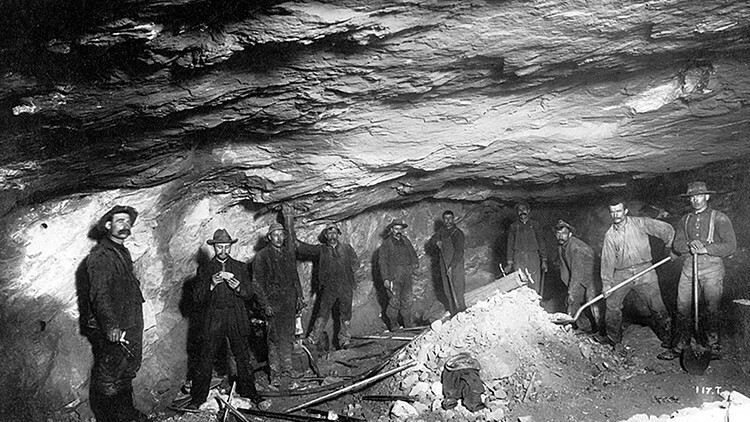 Following the California Gold Rush (1848-1855), miners were in search of new gold sources. In 1880 a mining engineer from Sitka, George Pilz, offered a reward to any local chief who would bring him to a gold mine. 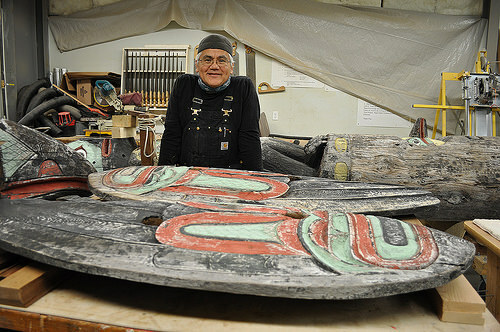 A Tlingit tribe chief named Kowee was the first one to bring actual gold samples to Pilz. The latter sent Joseph Juneau and Richard Harris to explore the supposed ore of gold in August 1880. …the most gold bearing quartz I had ever seen in one gulch. On October 18th 1880, Richard Harrison and Joseph Juneau marked 160 acres of gold near the townsite where mining camps were soon established. Few weeks later hundreds of miners reached the shore of the Gastineau Channel. Treadwell Mine Gold Miners. Juneau Alaska (circa 1890s). The Historic Treadwell Mine (the mine was closed in 1922 and is now preserved as a historic site). 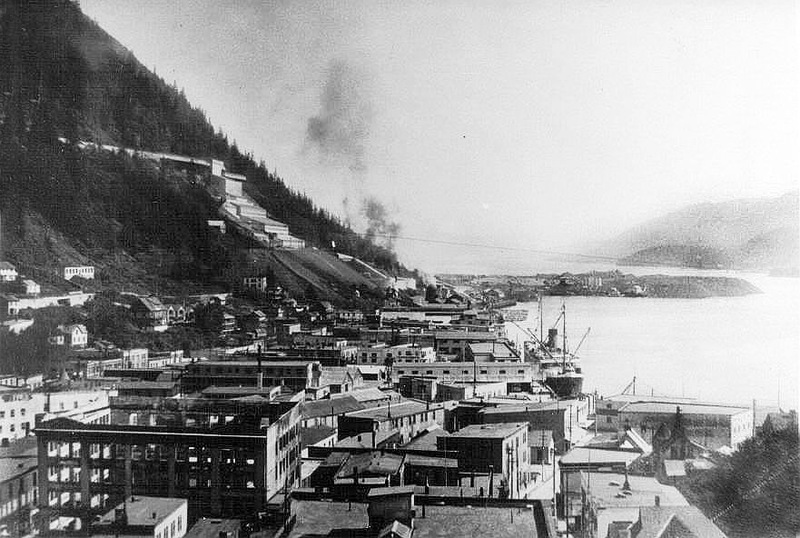 As rumours of the gold paradise spread and miners kept arriving, Juneau rapidly grew from a small settlement to a full sized city. In the beginning, locals were thinking about naming the city Harrisburg. However they ended up naming it Juneau (after Joseph Juneau). Before 1906 the capital of the District of Alaska was Sitka. Juneau was growing in size, accommodation, and possibilities as more and more people were attracted to its gold ores. With great population a greater number of legal disputes started to arise. The only way to reach a judge was by travelling to Sitka. This proved quite inefficient because in the early days only 2 ships per month connected the two cities. And since Sitka’s importance had significantly dropped (for many reasons) it was decided to move the seat of the District’s government (and later Territory’s, then State’s) government to Juneau. The political and economic ramifications of this decision are actually quite complex, and we encourage you to read more about Juneau’s role in Alaska history. A view of Juneau looking south from downtown in the 1930s. Photo source. Further reading: Why is Juneau the State Capital of Alaska? How did Juneau Become Alaska’s Capital? As of today, Juneau stretches for over 3,255 square miles (making it the second-largest city in the US by area), but only 14 square miles are inhabited. It’s population has reached 32,000 people according to the 2017 Census. The main prospering industries of Juneau today are fishing and tourism. During the summer, over 1 million tourists arrive and depart from Juneau. The splendid views, breathtaking nature, and the vibe of a small city with the amenities of a state capital are indeed just some of the many reasons to visit Juneau. We’ve written a post on our blog about interesting things to do and see in Juneau, about the top restaurants and quirky bars in town. Also, if you are planning an extended lodging in Juneau, we’ve got it all sorted out here. 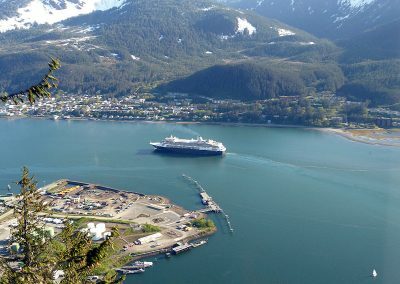 Juneau’s permanent population is 32,000, but it can actually change with about 6,000 people arriving each day on cruise ships or by plane during the summer months. There are no roads connecting Juneau to the rest of Alaska! The city is isolated and can only be reached by plane or ship. Honolulu (Hawaii) is the only other US State capital with no road connections to North America. Juneau was the first city to be founded in Alaska after the Russians sold it in 1867.